The National Weather Service described the storm as "about as fierce as they come!" Hurricane Harvey made landfall late Friday as a stronger-than-expected Category 4 storm. At the request of Texas Gov. Greg Abbott, President Donald Trump signed a presidential disaster declaration ahead of Harvey’s landfall. Massive destruction took place in Texas cities including Rockport and Corpus Christi just after the hurricane made landfall. It has since been downgraded to a Category 1 storm and is now moving slowly inland over south Texas. The National Hurricane Center has warned of “catastrophic flooding” in the area over the next few days. Hurricane Harvey slammed into the coast of Texas late Friday as a powerful Category 4 storm, exceeding previous projections and threatening “catastrophic and life-threatening flooding” across the state. The eye of the storm made landfall at 10 p.m. local time over the northern end of San Jose Island, about 4 miles east of Rockport, according to the National Hurricane Center. This is about as fierce as they come! The National Hurricane Center upgraded the slow-moving, waterlogged storm to a Category 4 hurricane late Friday afternoon as its maximum sustained winds grew to 130 mph. It was later downgraded to a Category 3 storm at around 1 a.m. as it made landfall for a second time at Copano Bay, before being further lowered to a Category 2 about one hour later and then a Category 1. The hurricane is now moving slowly inland over south Texas, and the Center is warning of “catastrophic flooding” over the next few days. It is expected to become a tropical storm later Saturday, according to the National Weather Service, as it travels across the coast and up through Louisiana in coming days. Multiple tornado and flash flood warnings are now in effect across much of south central Texas. Here is a breakdown of the current watches and warnings across the area. The National Weather Service warned that Category 4 storms can result in “catastrophic damage” to even well-built frame homes, while dwellings like mobile homes will almost certainly be destroyed. Given the intensity of the winds ― Category 4 tops out at 156 mph ― large trees will also likely be snapped or uprooted. The last Category 4 storm in the U.S. was Hurricane Charley, which caused $13 billion in damages when it made landfall in Florida in 2004. In an intense livestream video, storm chaser Jeff Piotrowski said wind gusts at his location in Rockport reached 149 miles per hour Friday night and recorded debris flying past his car. At one point the roof of the building he was in appeared to collapse around him. Hurricane Harvey was expected to drop more than 20 inches of rain in some areas of Texas. Harvey is projected to drop 15 to 25 inches of rain on the middle and upper Texas coast, with some areas likely to see as much as 35 inches by the middle of next week. That’s on top of coastal storm surge flooding of 6 to 12 feet, the NHC said. “One of the things we know is that people tend to fixate on storm category,” Tricia Wachtendorf, director of the University of Delaware’s Disaster Research Center, told HuffPost in an email. “But these categories are based on wind speed. The city of Rockport suffered immense devastation after the storm made landfall Friday, with CBS reporting that people were trapped in various buildings, including a senior complex, and couldn’t be reached. A high school in Rockport reportedly sustained damage, as did a hotel. Rockport was one of several cities under a flash flood warning until the early hours of the morning. With a metropolitan population of about 450,000, Corpus Christi was expected to bear the initial brunt of the storm. As of late Friday night, more than 120,000 homes in the Corpus Christi area had lost power. The city said parts of the metro area could be without power for three to seven days. Forecasters expect Houston, the nation’s fourth-largest city and a major hub for the nation’s oil refineries, to get at least 20 inches of rain. A disruption to shipping lanes there could devastate the local petrochemical economy, with ripple effects throughout the U.S. economy, similar to what happened with Hurricane Ike in 2008. Cruise ships are also being diverted from the area. The National Hurricane Center had warned Friday that Harvey may actually end up hitting Texas twice. 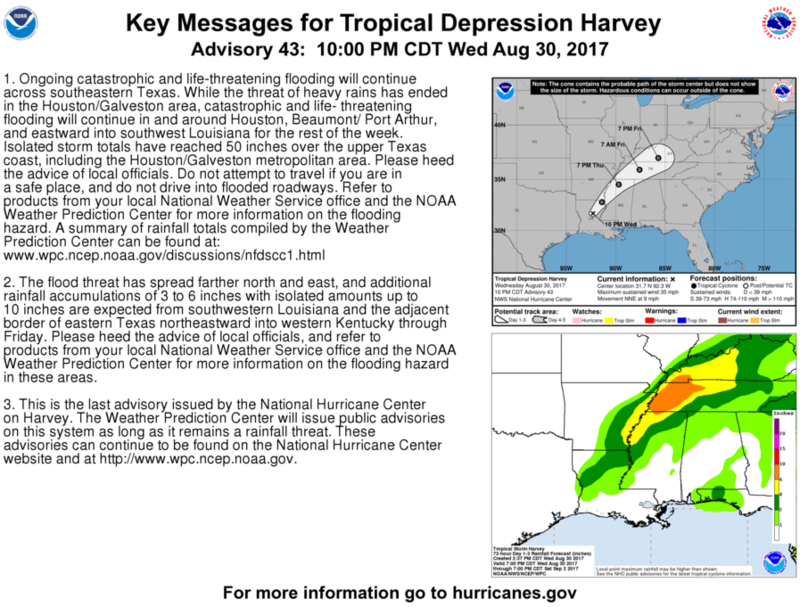 Experts told The Associated Press Harvey could land first on the central coast, then stall out and shift back into the Gulf of Mexico, where it would strengthen again and potentially hit Houston sometime next week. Store shelves in a Houston-area Walmart sit empty Friday, ahead of Hurricane Harvey. At roughly the same time Harvey strengthened into a Category 3 storm Friday, the coastal city of Galveston, near Houston, issued a tornado warning. Though the development wasn’t unexpected, it nonetheless added another element of danger to the situation. “Hurricanes will often create ideal weather conditions for tornadoes and severe rains that can destroy/make impassable evacuation routes,” Curt Harris, an associate director at the University of Georgia’s Institute for Disaster Management, explained to HuffPost in an email. A road sign warns travelers of Hurricane Harvey on Friday in Corpus Christi, Texas. Texas Gov. Greg Abbott (R) issued a disaster proclamation ahead of Harvey’s landfall for 30 counties in the state. Louisiana Gov. John Bel Edwards (D) declared a state of emergency for all of Louisiana. The White House announced on Friday evening that President Donald Trump signed a disaster proclamation, a move the president also touted on Twitter. The U.S. Department of Health and Human Services has also preemptively deployed 460 medical personnel and several mobile medical stations to the area. According to Gary Webb, chairman of the Department of Emergency Management and Disaster Science at the University of North Texas, cooperation among all levels of government will be critical to handling Harvey, should it reach catastrophic levels. “All disasters are local, but by their very nature large-scale crises create demands that exceed local capacity and require the intervention of higher-level governments,” Webb told HuffPost in an email.